Most ELC AMX drivers do the exact opposite of this rule, i.e. they drive around like a chicken with its head cut off, and they either can’t aim their gun at their target because it’s not in front of them, or their aiming reticle is huge from driving and they miss badly. The ELC AMX thrives when played as a hybrid TD/scout as opposed to an active scout (driving around to keep tanks spotted) or a pure passive scout (sitting in a bush and not firing), because the tank lacks a turret, the gun is potent, and the gun handles very poorly. The most effective method of spotting in the ELC AMX is to find a position that provides you with a good field of view and adjacent hard cover. From such a position, you can spot tanks and fire on them, then pull back behind hard cover until you are invisible, at which point you can spot and shoot again. While the ELC is incredibly mobile, you want to leverage that mobility in spurts, to either move to a new forward position, flex to a flank that needs help, or get behind or underneath a tank so that they can’t fire at you. The key to success in the ELC AMX is to leverage its vision control, mobility, and the TD-quality gun while managing its poor gun handling and extreme fragility. With these strengths and weaknesses in mind, your goal is to create first-shot opportunities, i.e. situations in which you spot the enemy and have sufficient time to aim and fire before they spot you. If you are spotted after firing, you should immediately pull back behind hard cover until you are no longer spotted. On paper the low view range of 360 meters would seem like a meaningful drawback, but the ELC AMX has superb camouflage so you’ll often out-spot enemy tanks. The ELC AMX when played properly is the ultimate ninja assassin – sometimes the tanks you’re firing on won’t even spot you. When you’re spotted, there is a delay of 3 seconds before Sixth Sense procs. Given that, and the facts that the ELC AMX is fragile and has a long reload, after firing your gun it’s a good habit to assume that you’re spotted and behave accordingly, i.e. pull back behind hard cover. You may be concerned that pulling back may cause you to lose spotting on enemy tanks, but remember that tanks remain lit for 5-10 seconds, so even if you pull back immediately after firing, you’ll know after 3 seconds whether you were spotted, and if you were not spotted you can move back into your spotting position. In most cases, the enemy tanks will remain lit during that period. ELC AMX drivers like to do drive-by’s on targets, where they drive toward them, fire, then drive away. This can be very effective when it’s done carefully. Given the awful gun handling and long reload, when firing on the move you need to get very close to your target to ensure your shot doesn’t miss. Obviously you don’t want to try a drive-by on an opposing tank if they are supported by other nearby tanks that will shoot you. The better option is to maintain distance, setup a first-shot opportunity, rinse, and repeat. Against some taller tanks with poor gun depression (e.g. mid-tier Soviet heavies such as the KV-1S, KV-2, KV-85, T-150, etc), you can hug your opponent while you’re reloading, then reverse a bit to fire, then go back to hugging. You need to be careful that you don’t allow them to ram you; the ELC AMX is a paperweight and even slight contact with most tanks will damage and de-track the ELC AMX. Basically the crew skills are selected to maximize vision control and gun handling. Binocs require your hull to be stationary, therefore I recommend using the “lock hull” command once you settle into a camo-sniping position. With “lock hull” turned on, you can move your aiming reticle to the extent allowed while keeping your hull stationary. The “lock hull” command is bound to “X” by default. The ELC AMX gets scout matchmaking, so even though it is a tier 5 tank it sees tier 6-8 battles. In tier 8 battles, you face tanks that can 1-shot your tank, so you have to play more carefully as compared to tier 6 battles. I have published an in-depth guide on light tanks, so if you’re looking for more tactics and tips, I recommend checking that out. These videos are part of my “Road to Unicum” tank reviews in which I share what I’ve learned as I progress towards account Unicum rating (top 1%). I talk through how I’m reading each battle as it unfolds and discuss key decisions and mistakes. My hope is that these videos meaningfully help other players improve their gameplay. The ELC was one of my favorite tanks to level so far. It took me a while to get the hang of it, but once I did, I really enjoyed it. Now that I’m getting close to the batchat, I’ve been thinking about buying it back again and kitting it out. Just curious, but do you intend on taking the line higher? I’d love to see a vid on the Lorr 40-t. I just got this tank and it’s pretty awkward to play so far. Your videos are great and I’ve learned a lot from watching them. Not to mention, I’d never really tried this game until I read about it on your website. The ELC was one of my favorite tanks to level so far…I’ve been thinking about buying it back again and kitting it out. The ELC is the one tier 5-6 tank that I’ll probably never sell. I tend to sell tanks to buy others, due to lack of trained crews and lack of silver credits, but the ELC is so much fun to play! When I came back to WoT in October, I wanted to play a French tier 10 autoloader: the BatChat or the 50B. Prior to getting the 50B, my gut feeling was that I’d prefer the BatCat because of its awesome mobility and vision control, and it’s not huge-as-a-barn like the 50B. At this point, I have the 140 (over 150 battles played) and am ~55k XP from unlocking the T-62A. I’m curious to see how the 62A compares to the 140. Going for the 140 was a good move for me – I love the tank. Based on viewer/reader interest I started up the IS-7 line recently, starting at tier 7. Moving up the IS-7 line should be relatively painless given that I already have the gun upgrades researched from having played the IS-4 line. I’m also incredibly interested in the T110E3 but am unwilling to play the T28 again, or even set foot in the T95, based on a miserable experience with the T28’s atrocious speed. It would take about 380k Free XP to skip the remainder of the T28 grind and skip the T95 entirely, and that represents about $50 USD to buy the gold for Free XP. These things are all competing with my interest in grinding up to the BatChat, since grinding takes time. From what I’ve heard, the Lorr 40t is like a weaker up-tiered 50 100, which is a very good tank. A lot of players complain about the 40t as it’s alpha is relatively low for tier 9 and it’s a big and brittle tank. Right now I only have 2 French Commanders and they’re in the ELC AMX and 50B. It has been some time since I played but the T28P was one of my overall favorites. Yes the speed made you want to cry but this is the tank that taught me positioning for deflects. So it’s been half a year, but I did move up the French line and I unlocked the Bat Chat several days ago. It is my favorite tank by a mile. If you haven’t seen the videos already, Episode #24 of my “Road to Unicum” series covers the AMX 12t, episodes #23 and #25 cover the AMX 13 90, and upcoming episode #27 will cover the Lorraine 40t. This was one of the best videos I’ve watched you play. Great job on a hard to master tank. Do you want to make à Platoon with me. Pls. I am awesome. Hey, I know this is a bit of an old post, but would you recommend coated optics on the ELC? I recently bought the coated optics, but I do have some gold to demount if necessary. Thanks, and great post! I listed the recommend equipment in the guide – no other setup makes sense based on the mechanics of the tank. I noticed that your (very good) article does not have anything on: A. Elc vs Elc duels. The later is a new mechanic of course, but maybe you might want to include it? Hey bud, look up some 슨두부찌개 videos on YouTube. ELC AMX player with over 20,000 battles, and 8 skills on his crew. This guy is absolutely insane, and destroys even in T8 battles. Is that the player QuickyBaby has featured before? If yes, I’ve seen his videos. He’s terrific with his ELC and rather dedicated. Up through that players first 8,000 battles, I actually had better stats than him. Lulz. Yeah, that’s exactly who I’m talking about haha. He’s the reason I just impulse-bought the ELC. I’m doing really awful with it though, haha. It seems pretty meh without crew skills or anything. I’ve had some pretty decent battles so far, but obviously nothing compared to him! I’m curious why you don’t choose vision skills for the commander. Situational awareness then recon. It seems to me that the base spotting distance is a little shy (though bino’s help and I use them). It seems to me, this tank already has excellent camo rating, so crew skill camo seems like it would be unnecessary. Not arguing, you’re a much better player than I am, just looking for advice and reasoning. I was thinking of changing driver to Sisterhood of Steel, Smooth Ride, Camo or Clutch Braking. Just to add, with 92% situational awareness, and not using Strong Coffee (100% crew) with the same skills listed above, if I’m on the move and bino’s are not active, my view range is only 378. While I understand, the preferred playstyle is finding a concealment spot, sometimes you have to move and advance and it seems to me that the extended view range would be helpful. Then again, maybe that’s why camo skills are good so you don’t get spotted while moving and getting close? Camo skills so significantly improve your chances of not being spotted that they are well worth it. For any light tank (and non-brawling TDs), you want to prioritize not getting spotted over spotting. Sixth Sense and Camo should be your 1st two Commander skills. The challenge for the ELC is two-fold: there are only 2 crew members, and the gun handling is awful. What this means is that the Commander has to double as the Gunner, and you’re forced to choose between Snap Shot and Situational Awareness for the 3rd skill. The bottom line is that the base vision (360) for the ELC is low, and increasing a small number by a small number yields low benefit. That’s why Binocs and camo-sniping is so important for the ELC. Terrific, thanks for your reply. I’ll be adjusting my crew skills…when I have the gold. So, with the new changes to ELC, do you still recommend the above setups? I have always kept a camo net and vents on mine rather than the rammer, and continue to, since I generally find myself passive spotting, and the weaker speed keeps me from displacing as effectively when spotted. I am currently running 6thsense/camo/SA, and camo/offroad/smoothdriving, with the intent to replace the third skills with BIA at 100%. Yes, I recommend the same setup. I guess I’ll have to give it a try. I have achieved two marks of excellence so far using my current setup, and your results seem better, but it could be that I simply have less practice. I really like being able to watch enemy tanks drive by me in my bush with camo net up, then spot even the camo TDs out to the max range. 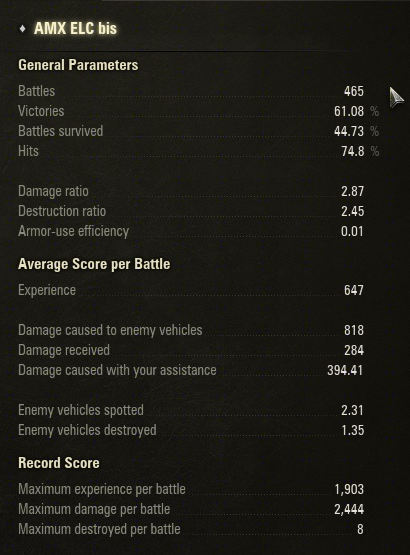 But the number don’t lie: I typically have poor spotting damage scores, even with all the pluses. Then again, some of that is because I often can’t resist taking long range sniper shots when the target is one-shot-able. You give up a ton of vision by running Vents instead of Binocs. I’d argue that not only are you not spotting as well as you should be, but you are failing to spot targets early enough that you and your team can kill them before they get close to you. Certainly. I will definitely keep the binos. My concern is over giving up my camo net and vents for a GLD and rammer, especially with the nerf to fire rate. Right now I play a role similar to an infantry sniper. I find an excellent spotting position if I can, and use the big gun to one-shot vulnerable enemies, especially heavies who have pulled back due to low hp, usually right into my crosshairs. But, I only have a 51% WR in it thus far, either due to my build, lack of experience, or both (probably both). So, my current thought is: swap camo net for GLD, since I find the aim time far more annoying than the reload, keep the vents as a artificial BIA substitute, and keep working my third skill set until I can retrain it for BIA, then remove vents and replace them with a rammer.